This edition of Stories from Practice takes us to Nepal where in spring 2015 devastating earthquakes killed thousands of people and destroyed over 750,000 homes and vital infrastructure. Arthi Patel was appointed by the Australian Department of Foreign Affairs to support the UNDP in their provision of humanitarian disaster relief. The paper outlines how Arthi, in her role as donor representative and partnership broker, helped the earthquake recovery project to succeed amidst the urgency of delivering rapid relief action and tensions between partner organisations. In the aftermath of the 2015 Nepal earthquakes Arthi worked for DFAT and UNDP to assist 14,000 micro-entrepreneurs recover their livelihoods. This was a high-pressure environment with strained relationships and high expectations. Arthi fostered an adaptive management approach, and with the support of her PBA mentor trialled different forms of brokering, collaboration and reflection. A focus on a higher purpose of recovery for micro-entrepreneurs helped people to break through bureaucratic and institutional hurdles. The paper describes how collaborative practice was fostered and came to be valued by all parties in a pressured environment. Read Arthi Patel’s paper here and share your comments via Twitter using #partnershipbrokers. Join us in this edition of Stories from Practice to explore together with Mariana Merelo Lobo how partnering processes will benefit from bringing awareness and presence into the collective collaborative space, and which practices to adopt to systematically cultivate awareness in oneself, partners and the collaborative field. During her PBA Accreditation period, Mariana was based in Tanzania for Action Against Hunger working with organisations and individuals, including holistic health practitioners, local non-governmental and governmental organisations, INGOs, and the UN. What emerged from her partnership brokering practice at the time, was the idea to develop and explore collaborative spaces through awareness. Based on the insight that by expanding our awareness – of the self, of the relationships, and of the wider system – collaborative processes achieve better results, this paper is focused on the importance of action-reflective practice in partnership brokering. This implies that a partnership broker must apply her or himself to three dimensions: subjective, objective, and inter-relational. Partnership brokers are part of a collaborative system; and therefore they have the responsibility (and opportunity) to do better to expand the collective (and generative) intelligence of collaborative efforts. This paper proposes an emergent way to developing and exploring a dedicated partnership brokering field – that approach is called Awareness Express. Read Mariana Merelo Lobo’s paper here. If you would like to share your comments with the author or us please email learning@partnershipbrokers.org, or perhaps tweet about it using #partnershipbrokers and following us @PBA_Brokers. We are starting the new year with an invitation to reflect on your partnership practice by diving into experiences and insights from other partnership brokers in our series Stories from Practice. Shahina Bahar embarked on her PBA Accreditation journey in 2015 when she worked as an internal broker for a large international humanitarian organisation, at a time where the humanitarian sector saw significant shifts in the external environment as part of reforms and localisation agenda. In her paper Shahina introduces the idea of “tactical agency” as a strategy to navigate complexity in a partnership. She explores how advancing or withdrawing different aspects of her role, according to the situation and perceived needs of the partnership, may create more space, visibility, legitimacy and traction for a partnership broker. The paper reflects on the brokering identity and how ‘tactical agency’, linked to notions of identity and awareness of opportunities and constraints in an operating environment, can be a useful strategy when navigating complexity. The paper provides examples of how tactical agency highlights the interplay of the broker as a change agent/actor; the partnership (phases, considerations, different models) and the external environment in which these partnerships operate as well as the tactical agency that partners exercise themselves. It can be a valuable device on how to traverse the ‘grey zone’ drawing from learning within the humanitarian sector. Read Shahina Bahar’s paper here. If you would like to share your comments with the author or us, please email learning@partnershipbrokers.org, or tweet about your views and experiences using #partnershipbrokers. In September we launched a new knowledge sharing initiative – Stories from Practice – publishing compelling papers which examine the realities of partnership brokering, and how practitioners navigate these to help partnerships progress and achieve transformation. These papers have been created by alumni of the PBA Accreditation Programme as part of their learning journey. Continuing the launch theme of the art & science of partnership brokering, we have invited PBA Accreditation alumni Kate Hayes to share her paper which reflects on intuition as the art of brokering. This paper argues that partnership brokering can be strengthened through both a science and an art orientation and explores how creative discernment – intuition – has been critical to the author’s art of brokering. Throughout the partnership process the broker is responsible for shape-shifting from coach to facilitator to mediator to challenger to finisher. This shape shifting requires active and rational discernment. At key transition points in the partnering process, however, the author also learnt the value of ceding the rational and the scientific to allow her intuition to instruct and to inform. Two case studies are provided that illustrate how at certain times a different way of seeing and discerning – an intuitive way – can lead to surprising and positive outcomes for the partnerships at hand. Read Kate Hayes’ paper here. If you would like to share your comments with the author or us, please email learning@partnershipbrokers.org. Fascinating stories from partnership practice. PBA is launching a new knowledge sharing initiative. Twice a month we will be publishing compelling, interesting, and sometimes thought-provoking papers which have been conceived and created by alumni of the PBA Accreditation Programme. Inviting readers to dive into individual journeys of reflection, authors share the insights gained during their mentored practice. These individual stories of exploration of partnerships, of self and others, and of learning, are important pieces. Each of which is contributing to a colourful, diverse, and ever-growing mosaic of what partnership brokers do to achieve real transformation. These papers have been entirely written by candidates, and have not been edited by PBA. This month we are looking into the ART & SCIENCE of partnership brokering. Starting the series off, we are presenting you with a marvellous paper on artistic expression as a tool for deep self-reflection by CAROLYN WAYE. The author’s background as a singer has taught her that song can often express mood and thought in a way that is hard to duplicate using other methods of communication. Mentorship and self-reflection helped the author find the strength to express her learnings through song thereby finding deeper meaning and connections to her work. The author hopes this exploration will help brokers be open to embracing courageous new ways of strengthening their brokering practises through artistic expression. This paper suggests that incorporating artistic expression into self-reflection and partnership processes can open the mind to insights in professional practise. Read Carolyn’s paper here. If you would like to share your comments with the author or us, please email learning@partnershipbrokers.org. PBA is delighted to announce the publication of Shaping Sustainable Change: The role of partnership brokering in optimising collaborative action. The idea of writing the book was first discussed in 2014 and, a year later, was given impetus by the positioning of multi-actor partnerships as central to the achievement of the UN’s Sustainable Development Goals. At the same time, increasing attention was being paid to the role played by individuals and organisations who acted as ‘boundary spanners’ and ‘bridge-builders’ for these relationships. Shaping Sustainable Change aims to make the case for partnership brokering and share information on this emerging profession. In order to offer a useful blend of theory and practice, the book combines the knowledge and experience of PBA’s international network of associates and alumni with perspectives from wider literature and the academic arena. The first section explores the profile and key activities carried out by partnership brokers, and the skills and competencies required to undertake this role. This is followed by examples of partnership brokering practice in relation to different contexts, sectors, themes and partnering phases. The process of compiling the publication has involved a committed group of authors, peer reviewers, editors and proofreaders to whom we are immensely grateful. 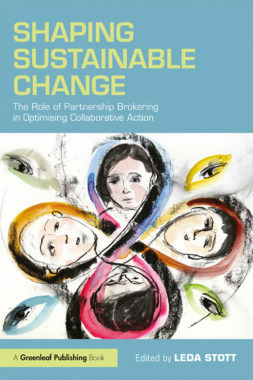 We hope that the book does justice to the work of partnership brokers everywhere and reinforces the importance of their contribution to building transformational collaborative arrangements for a more equitable and sustainable world. Published as part of the Promoting Effective Partnering (PEP) project, funded by the Ministry of Foreign Affairs in the Netherlands, the report draws on the experiences of partnership brokers worldwide. It explores the emerging lessons about partnering in diverse contexts – exploring the factors at national and local levels that impact what partnering is possible. PBA is one of 5 partners in the project. The other 4 are: The Collective Leadership Institute, Partnerships Resource Centre, Partnerships in Practice & The Partnering Initiative. We often hear partnership brokers asking for more case studies – more stories about what works and what doesn’t, how other partnerships work in different contexts, what’s new, and what needs to be next on the horizon. So here is your chance to contribute to the growing bank of resources for practitioners: a piece in the next issue of the only online journal dedicated to partnership brokering: Betwixt & Between. Abstracts are due on 31 March 2016, final piece is due 30 April. Why not give it a go? Never written for a journal before? our Editor, Surinder Hundal, will work with you through the process to get your piece ready for publishing. How do you respond when a community asks you to help them to access health services, education and jobs when your programme doesn’t have funding for these things? Managers of the Urban Partnerships for Poverty Reduction Project (UPPR), a large programme managed by UNDP in Bangladesh, did so by becoming expert partnership brokers. They helped to create win-win collaborations between the communities themselves and local NGOs, Government departments and companies. Tom Harrison was so impressed with this approach that he has written a paper explaining what he found when he was commissioned by UNDP to evaluate this programme. He explains how the brokering works in practice and why he thinks this is a valuable lesson for any organisations seeking to ‘do development differently’ in the new SDG world.